A discovery made by the researchers from Drexel University could create roads that melt off snow and ice during winter storms. This is possible by incorporating a minimal quantity of paraffin wax to the road’s concrete mix. The research team headed by Yaghoob Farnam, PhD, an assistant professor in Drexel’s College of Engineering explains how substances such as paraffin oil — referred to as “phase change materials” in chemistry — can be applied in concrete to store energy and discharge it as heat when a road requires a melt-off. The details can be found in a paper recently published in journal “Cement and Concrete Composites”. Keeping roads open to travel is a persistent challenge during winter period, but efforts to make them safely drivable — including the continual use of deicing chemicals, snow plows, and road salt — tend to weaken the surface. The road salts and chemicals presently used to melt ice and snow can also have a deleterious environmental effect when surface runoff transports them into adjacent ecosystems — which is quite possible considering Pennsylvania State alone dumps over 900,000 tons of it on roads every winter. Therefore, for some time researchers have been keen to find a better winter option than salting and plowing. Farnam’s team in partnership with researchers from Purdue University and Oregon State University, is among the first to show that using phase change materials as an environmentally friendly alternative can be just as effective as the conventional salting and scraping techniques. Phase change materials can be incorporated into concrete using porous lightweight aggregate or embedded pipes and when PCM transforms from liquid to solid during cooling events, it can release thermal heat that can be used to melt ice and snow. By inhibiting the formation of ice and snow on the pavement or bridge surface, the use of PCM may reduce or eliminate the need for deicing chemicals/salts, snowplowing or both — thus saving money and positively influencing the environmental impact of such operations. Paraffin oil, a common ingredient used in cosmetics, wax polishes, candles, and water-proofing compounds, was their material of choice for this attempt as it is chemically stable, organic, easily available, and relatively inexpensive. Like all phase change materials, it emits thermal energy when it changes its physical state, which means as temperatures decreases and the oil starts to solidify it emits energy through latent heat of fusion. This means paraffin oil can be customized to embed deicing capabilities in a road surface so that it turns thermally active during snowy weather or when deicing is required. With temperatures within the boxes held between 35-44 °F, both of the paraffin-treated slabs were able to totally melt the snow within the first 25 hours of analysis, while the snow on the reference sample stayed frozen. The slab with the paraffin-filled tubes melted the snow marginally faster than the one made up of paraffin-treated aggregate. Farnam proposes that this is due to the paraffin inside the tubes is able to solidify more rapidly — thereby emitting its energy — because of the standard diameter of the pipes, while the diameter of the pores of the aggregate differ in size. But in the team’s second trial, in which the ambient air temperature in the box was reduced to freezing before the snow was put, the paraffin-treated aggregate was more effective than the embedded pipes. This is because the capillary pore pressure slowed down the freezing of the paraffin, thus allowing it to discharge its heat energy over an extended longer period of time. 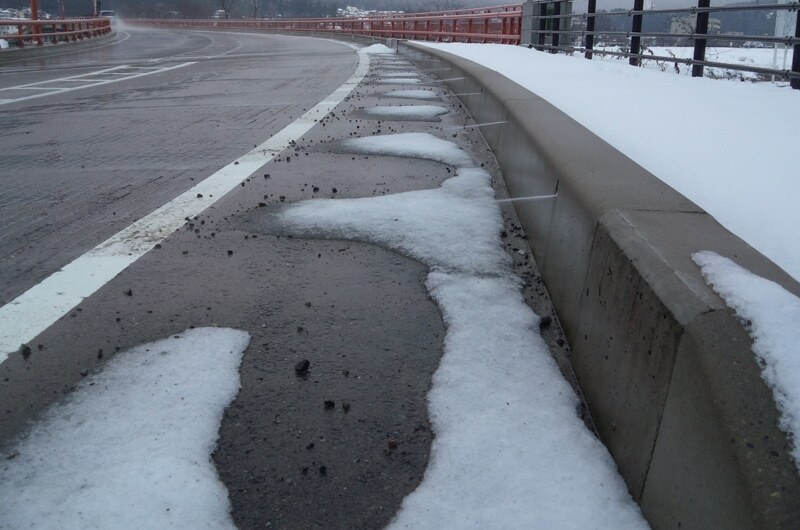 The gradual heat release due to the different pore sizes in porous light-weight aggregate is more beneficial in melting snow when concrete is exposed to variety of temperature changes when snow melting or deicing is needed. We believe that using porous lightweight aggregate can be potential way of incorporating phase change materials in concrete as it is easy to be implemented in practice and can cover environmental conditions of various locations in the US dealing with snow, especially melting snow or deicing in roads and bridges in the Northeast. One of the first applications of this infrastructure technology could be at airports, where keeping runways free of snow and ice is critical and a continuous challenge in the winter. This research was supported by the Federal Aviation Administration as part of its Heated Airport Pavements Project in its Partnership to Enhance General Aviation Safety, Accessibility and Sustainability program. Additional research is needed to further understand other factors influencing concrete constructibility, including concrete fresh and hardened performance when the concrete contains phase change materials, and the phase change material’s thermal performance in different locations in the U.S. Eventually this could be used to reduce the amount of deicing chemicals we use or can be used as a new deicing method to improve the safety of roads and bridges. But before it can be incorporated, we will need to better understand how it affects durability of concrete pavement, skid resistance and long-term stability. Phase change is an interesting concept. How would this work in Buffalo NY where it is 20F for long periods of time? Once the paraffin solidifies and liberates its heat, it can't cycle again until it absorbs heat and re-liquifies. Are there any steps being taken to enhance re-liquification?